2019 : S N Bose Fellowship awarded to Milind Srivastava. 2019 : Best Poster Award awarded to Keerthi K., and Chester Rebeiro. 2019 : Best Student Paper Award awarded to Saptakatha Adak. 2018 : IESA Techno Visionary Award awarded to V. Kamakoti. 2018 : Best Paper Award awarded to Revathy N.
2018 : Alumni Association Prize awarded to Santhoshini V, and Sanchit Agrawal. 2018 : President of India Gold Medal - IIT Madras awarded to Rahul Kejriwal. 2018 : Google India PhD Fellowship awarded to Arulkumar S.
2018 : IBM Best Ph.D Thesis Award for the Best PhD Thesis in Dept of CSE, IITM awarded to Sajin Koroth, and Raghavendra. 2018 : Biswajit Sain Memorial Prize awarded to Shiladitya Pande. 2018 : Lakshmi Ravi Best Dual Degree Project Award awarded to Sanchit Agrawal. 2018 : Prof H N Mahabala Endowment Prize awarded to Ganesh K.
2018 : Institute Chair Professor at IIT Madras awarded to C. Pandu Rangan. 2018 : Swati/Jayalakshmi Memorial Award awarded to Santhoshini V.
2018 : Prakash Arora Prize awarded to Purvi Goel. 2018 : Computer Age Management Services Pvt Ltd (CMC) Prize awarded to Rahul Kejriwal, and Yelamarthi Satya Surya Venkata Sasi Kiran. 2018 : B. Ravinchandran Memorial Prize awarded to G Kavitha. 2018 : Sri. K Krishnamurthi Prize awarded to R Raghul, and E Santhosh Kumar. 2018 : Dr. A.P.J Abdul Kalam HPC Award awarded to Rupesh Nasre. 2018 : Srimathi Marti Annapurna Gurunath Award for Excellence in Teaching awarded to Jayalal Sarma. 2018 : Google Faculty Award awarded to Mitesh Khapra. 2018 : Best Paper Award awarded to Sudarsun Santhiappan, Jeshuren Chelladurai, and Balaraman Ravindran. 2017 : INAE Young Engineer Award awarded to Aritra Hazra. 2017 : Fellow of Indian National Academy of Engineering awarded to Hema A. Murthy. 2017 : Dronnadula Nagaratnam Reddy Award awarded to Ajay Fuloria. 2017 : Computer Age Management Services Pvt Ltd (CMC) Prize awarded to Kotha Lok Prateek. 2017 : B. Ravinchandran Memorial Prize awarded to Susanna Maria Baby. 2017 : Alumni Association Prize awarded to Vidhya Ramaswamy. 2017 : Sri V Srinivasan Memorial Prize awarded to Vidhya Ramaswamy. 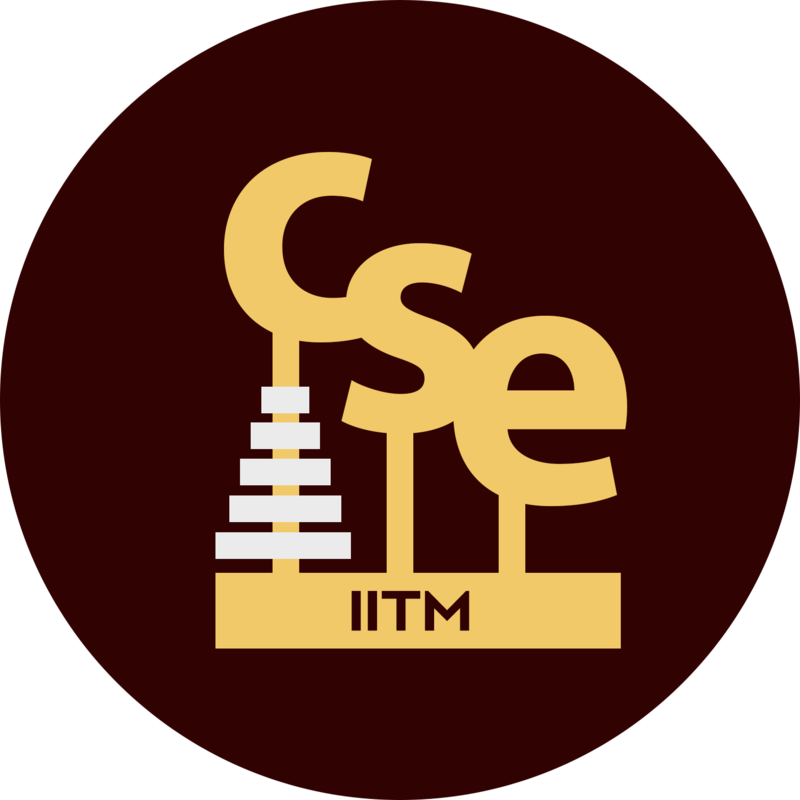 2017 : IBM Best Ph.D Thesis Award for the Best PhD Thesis in Dept of CSE, IITM awarded to C S Ganesh. 2017 : Google India PhD Fellowship awarded to Preksha Nema. 2017 : Biswajit Sain Memorial Prize awarded to Sarthak Parui, and P R Dhathri. 2017 : Prof H N Mahabala Endowment Prize awarded to Ajay Fuloria, and Naveen Kumar. 2017 : Lakshmi Ravi Best Dual Degree Project Award awarded to Sahil Sharma. 2017 : Prof C Sivaram Murthy Prize in CSE awarded to A. Sundar, and Sai Praveen.B. 2017 : The IIT Madras Distinguished Alumnus Awards (IITM-DAA) awarded to S. Sudarshan. 2017 : IITM Institute Research Award awarded to Vinu E V.
2017 : IITM Institute Research & Development Awards (IRDA) - Mid Career Level R&D Awards awarded to Krishna Moorthy Sivalingam. 2017 : Dr. A.P.J Abdul Kalam HPC Award awarded to V. Krishna Nandivada. 2017 : Best Student Paper Award awarded to Aritra Hazra.